1. My name is Sara Lancaster, and I live, work, and cook in Denver, Colorado. 2. I’m not a professional chef or even a trained cook. I simply love to write and want to write about something I will always do—eat. Sauces and dips have long had a place in my heart, because they are fun foods. Fun foods equal happiness. 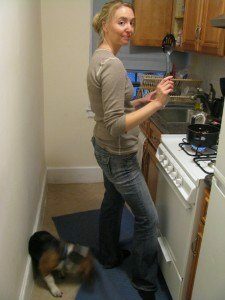 Where it all started…in a tiny NYC kitchen. 3. You should assume that some of the product links on this site are affiliate links. This means that I get a commission if you purchase an item or sign up for a service after clicking that link. Yes, I love to write and cook just for the sake of writing and cooking, but how am I supposed to pay for all those Tostitos and baby carrots if I don’t get paid?!? 4. After several years of food blogging it occurred to me to combine my attraction to fun foods with my marketing skills. In 2013 I launched The Condiment Marketing Co., which helps sauce, dip, jam, and seasoning companies spread their brands across the web. Today the Saucy Dipper works in conjunction with The Condiment Marketing Co. as the exclusive condiment enthusiast site that shares recipes, cooking tips, condiment news, and product reviews. 5. A huge shout out to everyone who helped get the Saucy Dipper going. Thank you to Jeannine Henderson for designing a killer header and logo. Thank you to friends and family for helping me brainstorm ideas and consistently reading my posts even when you probably don’t want to. 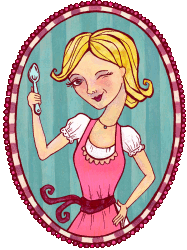 Thank you to my husband, Jason Lancaster at Spork Marketing, for being the ever-patient technical “web” guy. And last, but not least, thank you to Moe the Beagle for cleaning up the kitchen floor after me. 6. A bit of randomness: Proper comma placement stresses me out, and watching people run to catch the bus makes me laugh. Thanks for reading.